A poupourri of images from my experiences with white rhinoceros (Ceratotherium simum). 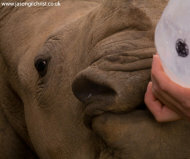 Featuring rhino San rock art, captive rhino, orphan baby rhino, rhino capture and translocation, and rhino in the veld. This is amongst the most awe-inspiring animals on Planet Earth. A behemoth. A gentle giant. A dinosaur-like mammal. I have been privileged to get close to free-ranging wild rhino in the bush, and to be involved in rhino capture enabling me to get up-close to tranquilised rhino, and to physically sample them for my research into Game Animal Stress Physiology. Seeing any species in decline in the wild is a concern, but the thought of losing one as iconic as the white rhino (due to poaching for rhino horn) to extinction is worrying.